Many shoppers like the idea of buying local. After all, it can mean fresher and healthier foods, stronger local economies, direct contact with food producers and in some cases — but not always — lower carbon emissions. But most of us have only a few options for participating in the local food movement: visiting the farmers market or signing up for a community supported agriculture (CSA) subscription. As the movement continues to grow and evolve, however, social entrepreneurs are experimenting with novel ways to make local agriculture an integral part of urban life. 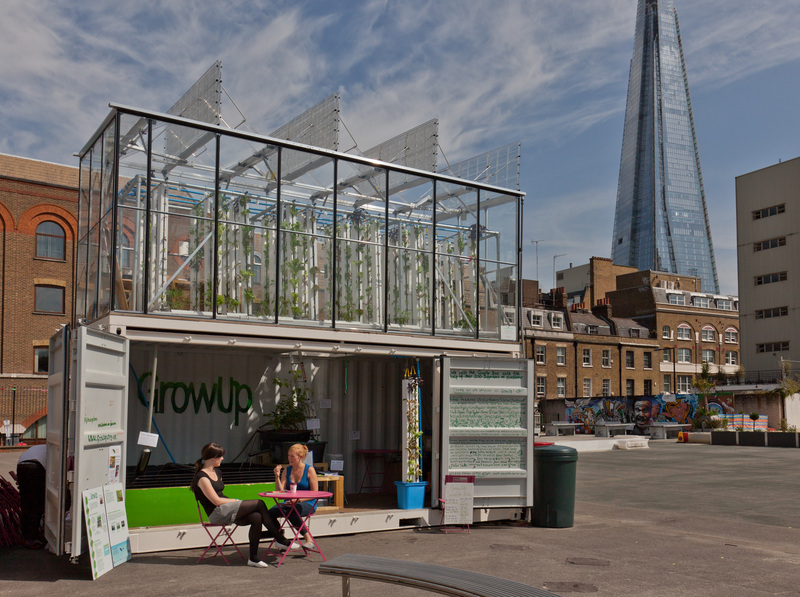 Kate Hofman and Tom Webster are giving new meaning to the phrase “box lunch” with their reinvented shipping container, the GrowUp Box. Inside the 20-foot container, tilapia are farmed in tanks specially designed to ensure the fish enough room to grow, while on top, greens are cultivated in vertical columns. The water from the tilapia tanks circulates through the columns, where the fish waste provides nourishment to about 400 plants. The fish and greens are sold to area restaurants. The project’s parent company, GrowUp Urban Farms, consults with people looking to build their own boxes and is set to start building the first commercial-scale aquaponics farm in London soon, Hofman said. Opening to the public this spring, the Beacon Food Forest in Seattle is turning a piece of public land into an edible forest garden. Residents will be welcome to forage in the forest, a 7-acre plot — adjacent to a city park — featuring fruit and nut trees, a pumpkin patch and dozens of berry bushes. The goal is to mimic a natural ecosystem, creating a space that requires less maintenance and offers higher yields, co-founder Glenn Herlihy says. At the Tokyo headquarters of the Pasona Group, a staffing company, tomatoes dangle from the ceiling, herbs grow fragrantly in meeting rooms and a rice paddy is the lobby centerpiece. The plants are intended to relax employees, encourage innovative thinking about agriculture and create a sense of community as workers tend to the crops. The foods grown in the office are prepared and served in the company cafeteria. Benjamin Greene, founder of the Farmery, plans to make the journey from farm to store more efficient by eliminating it almost entirely. The Farmery will be an 8,000-square-foot market with food shopping on the lower level and mushrooms, greens and fruits growing on the upper level. Whatever is not grown on site will be sourced locally. A smaller, Kickstarter-funded prototype — what Greene calls “a souped-up produce stand” — is currently in operation in Durham, North Carolina, and the first full-scale store is coming this fall, Greene says. The location, however, is being kept under wraps for now. Singapore, one of the most densely populated nations in the world, has little room available for farming. So inventor and entrepreneur Jack Ng created the Sky Greens system to grow more food in less space. Think of it as a plant skyscraper. The equipment holds up to 32 trays of greens — including lettuce, spinach and a variety of Asian greens — on a tall, narrow A-frame structure. The plants slowly rotate, as if on a Ferris wheel, so each tray gets sufficient exposure to sunlight. Sky Greens, which launched commercial operations in October 2012, harvests and delivers vegetables to Singaporean markets every day. The Brooklyn Grange comprises two and a half acres of growing space high atop a pair of office buildings. “We’re looking at ways to increase food production without increasing agricultural footprint,” spokeswoman Anastasia Plakias says. The operation grows more than 50,000lbs of food each year, which it sells through farmers markets, CSA subscriptions and wholesale accounts. In addition to boosting New York City’s local food supply, the farm also absorbs more than 1m gallons of stormwater every year, reducing the load the city’s systems must manage. After 30 years of building urban gardens in São Paulo, agricultural technician Marcos Victorino started running out of cultivable land. As part of his research work at local college Faculdade Cantareira, he designed a way to turn roofs, balconies and paved areas across the city into miniature farms. Victorino turns large roof tiles upside down, creating a long, V-shaped trough that can be filled with soil. These tile beds are elevated, making them easily accessible to children and the handicapped. Because the tiles are watertight, they hold in moisture, allowing growers to make the most of an increasingly limited water supply. The Prinzessinnengarten is an urban farm nestled in the shadow of the former Berlin Wall, between unused subway stops, graffiti-ed concrete walls and aging apartment blocks. Inside vine-covered fences grows a wide range of vegetables, all planted in easy-to-move containers — recycled Tetra Paks, rice sacks, and plastic crates — that allow the entire operation to be moved if needed. Visitors can pick vegetables, learn about seed harvesting and vegetable pickling, or visit the café to enjoy snacks made from the garden’s produce. 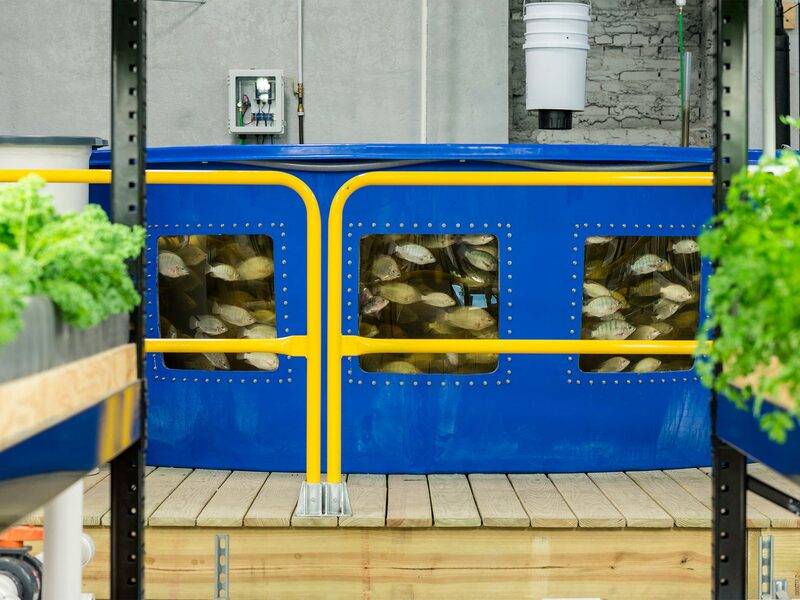 Located in a building formerly occupied by a commercial brewery, Urban Organics is an aquaponics operation that provides salad greens and fish to grocery stores and restaurants using just 2% of the water of conventional agriculture. Founder Fred Haberman, CEO of Minneapolis marketing agency Haberman, hopes the for-profit farm will prove the commercial viability of aquaponics and help spur economic development in the area. “If we can do that, I believe you’ll see more of these types of facilities popping up,” he said. The goal of Lufa Farms in Montreal is to create a “local food engine”, says the company’s greenhouse director Lauren Rathmell. At the heart of the operation are two sprawling rooftop greenhouses — currently totaling 1.75 acres — that produce a range of vegetables: greens and herbs, peppers and eggplants. The produce is packaged with locally sourced goods like handmade pastas, fresh bread and dark baking chocolate, and delivered to approximately 4,000 customers each week. And the business isn’t stopping there: It has two more greenhouses in the works. This story originally ran on TheGuardian.com on July 2, 2014. Click here to see the original and a lot more awesome urban farm photos. Do it. It’s worth it.